Upon arrival, the Preparatory School seems like a big place to little boys— but they learn to feel at home very quickly. 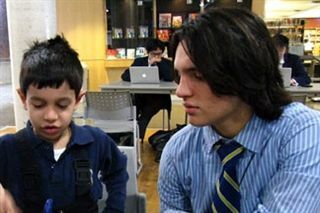 With about 400 students in Senior Kindergarten through Year 7, we like to say that UCC delivers “big school opportunities with a small school feel.” Our educators are passionately committed to offering a warm, nurturing environment for boys to develop the emotional, social and intellectual skills they need to find their unique path and make a lasting and positive impact on their world. Teaching at and leading schools around the world has instilled in me deep appreciation for the importance of learning in a culture that celebrates differences and gives voice to multiple perspectives. With unparalleled opportunities in every discipline, every boy finds his footing and unlocks his potential, whatever his unique path. Academically, the Primary Years Programme (PYP) — Senior Kindergarten to Year 5 — is the first step in the IB journey. UCC is currently a candidate school for the Middle Years Programme (MYP), which starts in Year 6; our goal is to be authorized as an IB World School by 2019-20. The PYP, therefore, would provide students with curricular links to this next stage of their IB education. While graduation day may seem like a long way off to our boys at the Prep, it’s worth noting that the effort of the IB Diploma Programme is well worth the enhanced recognition our graduates receive from universities. I encourage you to explore the sections here, linking to information about our full academic, arts and athletics program, and top-tier facilities. Then come and see what makes UCC’s student experience so exceptional.